The release John Stockton’s autobiography “Assisted,” to the public on Tuesday, October 29th kick-starts a much anticipated week in Utah Jazzland that concludes with the Jazz tipping off the 2013-14 regular season Wednesday night against the Thunder at Energy Solutions Arena. Two passionate Jazz writers were able to obtain advanced copies and for some terrific early insight into the book, check out reviews by Moni on Jazzfanatical and Diana on SLC Dunk. (UPDATE 10/29/13: Click HERE for a complete SLC Dunk review). As someone who has an entire book shelf filled with Utah Jazz media guides, magazines and books (including useless items such as this), I would probably buy a grocery list if it was written by John Stockton. With that said, the early-reviews make me particularly excited for this rare glimpse into the life and career of one of the most unique personalities in NBA history. Most NBA superstars have had their careers and lives documented and promoted by either themselves or others (Karl Malone for example has been featured in Beyond the Glory and Sportscentury documentaries) in some way, shape or form. For John Stockton, one of the most reserved and private superstars in all of professional sports, this book offers a rare public look into an often private professional career. As a 6-1 point guard out of Gonzaga (back when very few outside of Washington had even heard of the Zags) who was cut from the 1984 Olympic basketball team and would go on to win two Olympic gold medals, face-off against the greatest player of all time in two NBA Finals, and play 19 NBA seasons in the NBA’s golden era where he became the league’s all-time leader in assists and steals – one can only imagine the collection of Stockton stories on tap. While it’s highly doubtful Stockton will throw any former teammate under the bus the way many retired celebrities do to generate publicity and sell copies, the book still figures to be a gold mine of insight because Stockton has so often shied away from sharing his thoughts, memories and experiences to the public. The “Forward” was written by Hall-of-Fame running-mate Karl Malone and co-authored by Kerry Pickett – Stockton’s grade-school coach in Spokane, Washington and apparent confident. While the clip did include interviews with some of John’s closest friends and family from Spokane, in typical Stockton fashion there was no sit-down interview with John himself. As was so often the case throughout his 19-year NBA career, Stockton allowed everyone else to do the talking about him. He won’t be doing that with this book, and that’s precisely why you should buy it. John Stockton’s “Assisted: An Autobiography” can be purchased here on Amazon. In Monday’s Utah Jazz media day, perhaps the most interesting story told involved Trey Burke’s summer pilgrammage to Spokane, Washington (he was accompanied by Alec Burks) where he personally trained with John Stockton. In the past Stockton had worked with Deron Williams (prior to DWill’s breakout 2006-07 sophomore season) and there’s no doubt the amount of knowledge and experience he can impart to a 20-year old rookie like Burke is invaluable. One of the items Burke mentioned, was how to react when teams go “under” on the pick&roll. 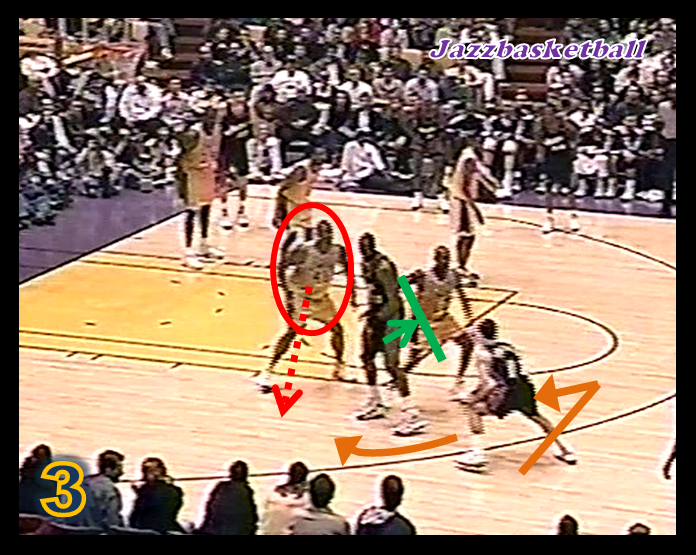 Burke stated that prior to working with Stockton, he was perhaps more prone to take a quick perimeter jumper but Stock taught him to be more patient and utilize the “re-screen.” This is another element of the pick&roll that Stockton&Malone worked to perfection and something you see players like Tony Parker of the Spurs still doing with great effectiveness now. The real benefit you get from immediately re-screening is you essentially invert the pick&roll (sort of like flipping the direction of a run in football if you see the defense overloading to one side). For example on side screen-roll instead of screening middle and rolling baseline, you’re screening baseline and rolling middle (or often popping as the weakside defense has more time to collapse and cut off the lane). Not only can you gain depth on the secondary screen, you often catch the defending big in “no man’s land” as he’s sagging off the screener to allow his guard to go under. If it’s side screen-roll, and the guard gets caught high, the screener’s man becomes the focal point and we all know 3/4’s of NBA bigs don’t defend screen-roll well. Additionally, if the defender goes under the first time, he’ll often go under again so the pull-up jumper will still be there if the big doesn’t step up – but you force the defense to work harder, increase the percentage of getting your team a layup, and still receive an equal or better look at the basket. This also takes patience and understanding on the screener’s part – to instantaneously recognize what the PG is doing, break off the initial roll and remain stationary long enough to set a legal “re-screen” – but also to know whether to pop or roll the second time around while providing the passer with the window to make that “pocket pass” which Burke mentions. Here’s a frame-by-frame example of a classic Stockton&Malone side screen-roll where they’re patient and “re-screen” to get a better shot. 2.) Here the defensive strategy is to play it soft and go “under” on Stockton. Stock’s man will meet him on the other side of the pick to cut-off the driving lane while the screener’s man will loosely defend the Malone which negates any immediate roll-action. Defensively, this gives Stock an off-the-dribble three but also prevents any uncomfortable scenario where Stock is penetrating or the bigman is required to move his feet or go out on the perimeter to defend a point guard. 3. Instead Stock opts to “re-screen.” The result is his man gets caught top-side as Malone screens baseline and this puts the onus back on the bigman. If he stays at home on Malone, he gives Stock an open lane for a layup. If he comes out to defend Stock 15-20 feet from the basket he risks Malone rolling to the rim for a dunk. Ultimately he comes out but too slow – and Stock hits a pullup 15-footer in his face. So Stock was patient, passed on an initial three, went for the re-screen which put all pressure back on the bigman to defend – and got a rhythm jumper from 15-feet. As you can see here, running the pick&roll to perfection is something John Stockton did it night-in and night-out for 19 seasons. Nobody is expecting Trey Burke to be another John Stockton – but he can take some of the things Stockton did and incorporate them into his own game to help become the best Trey Burke he can be. Despite the questions lingering after summer league, I believe a first-rate version of Trey Burke is something that will make Jazz fans smile a lot over the next several years. Another thing that should also is the fact that John Stockton is still assisting. 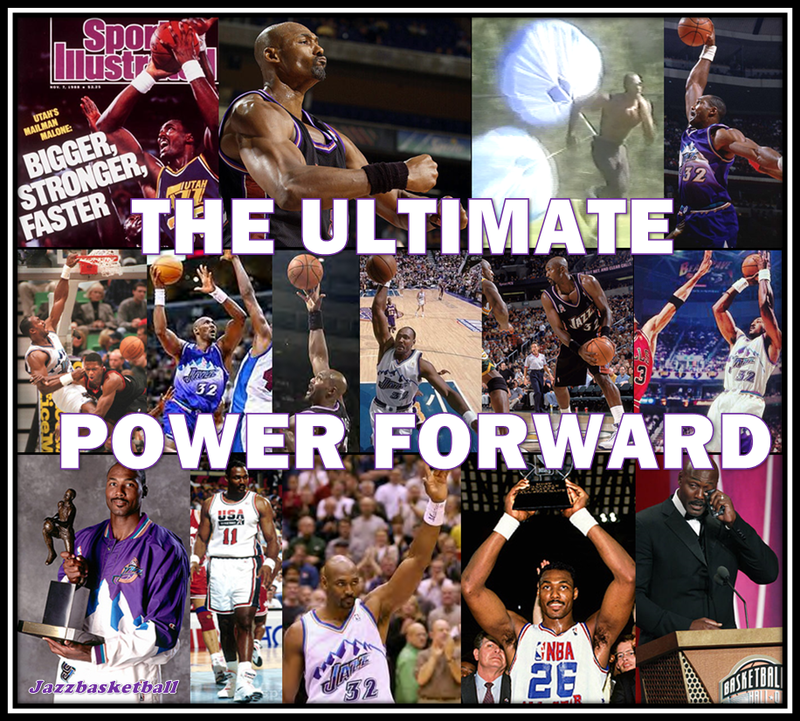 This is Part 6 of “The Ultimate Power Forward” series, detailing several of the key components that made Karl Malone the greatest power forward to ever play the game. For all of the diverse offensive skills (which have been covered extensively here over the past week) Karl Malone possessed that helped make him the second-leading scorer in NBA history, perhaps no play became as synonymous to the Mailman scoring than the pick-and-roll. Of course, it’s impossible to talk about Karl Malone running screen-roll without mentioning his Hall-of-Fame pick&roll partner: John Stockton. 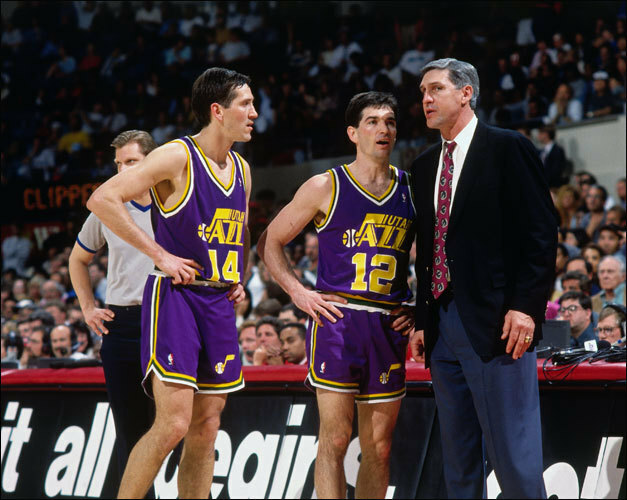 Together, Stockton&Malone put on nearly a two decade-long clinic of how to run the pick&roll. Any type of defense they faced within the rules, they would counter and execute. 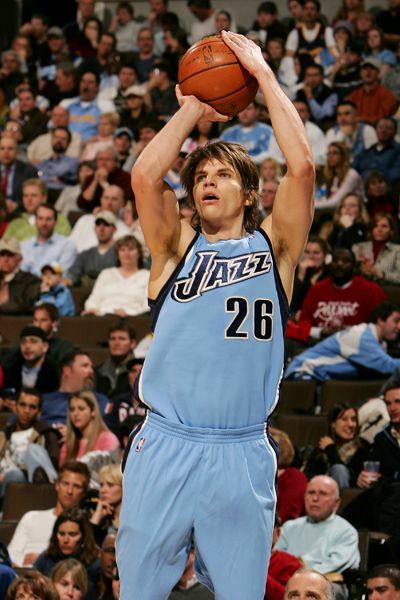 It starts with Stockton, who had supreme court vision, the ability to pass accurately and quickly (thanks to his ability to pass off the dribble with one hand rather than two) and was an excellent shooter off the bounce. Malone always set a rock solid screen and combined his mobility, great hands and supreme ability to finish with both power and skill around the basket – was the ultimate finisher. Together, Stockton&Malone were simply unstoppable on the pick&roll. In traditional side-screen roll, Stockton’s first read is always to go middle behind Malone’s screen – whose own read was to roll to the basket if the weakside help doesn’t come, or “pop” out on the baseline for the jumper if the help-defense rotates to shut off the paint. Here Malone’s man shows out on Stockton and the weakside help is slow. Malone rolls unimpeded to the rim and skillfully finishes over Kobe who is late in his rotation. On this play, the Chicago Bulls force the pick&roll baseline (a defensive staple of Phil Jackson coached teams). Utah counters with Malone simply re-screening to allow Stockton to drive baseline. This forces Malone’s man to help on Stockton and allows Karl to turn and roll uncontested to the rim. Chicago’s weakside help defense is slow to react and Malone has a wide-open lane to drive for the hammer dunk. Here in the same situation, Chicago’s help-defense reacts to clog the lane. As a result, instead of rolling – Malone simply pulls up from the elbow and drains the open 18-footer. Here against Houston, Stockton’s man decides to go under on the screen so Stockton knows he’ll have a clean look from the foul line area if the big doesn’t show out. The Rockets choose to stay with the screener (Malone), so Stockton simply pulls up and hits the open foul-line jumper. 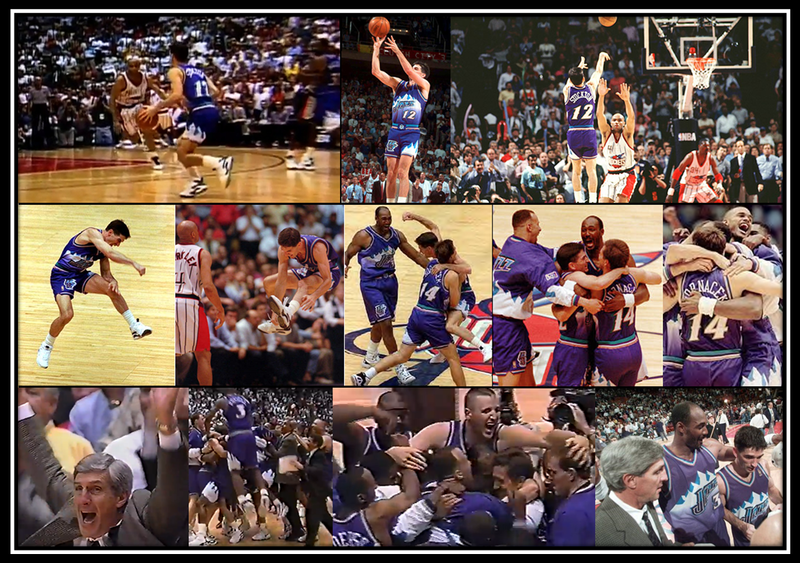 After playing together for 10+ seasons, Stockton&Malone developed a sixth sense for knowing when to slip the screen. Here, they again show their standard side screen-roll. Instead of setting the screen, Malone slips right to the rim. Because Stockton could pass so well off-the-bounce, his trademark one-hand pass right by his defender’s ear leads Malone perfectly and the Mailman makes an excellent one-handed catch on the move and promptly finishes strong at the rim for a three-point play. As Doug Collins said, “Whatever you show them, they counter it.” In the 90’s most offenses in the NBA were based more on isolation and post-ups than predominantly screen-roll. Now in 2013, with rule changes virtually every successful team relies on running the pick&roll to some degree of success. Guards are taught the nuances of the play at much earlier ages, and come into the league more skilled in that area. Nevertheless, the pick&roll bar set by Stockton&Malone has yet to be eclipsed. They did it longer, better, and more proficiently than any other duo in NBA history. Everyone knew it was coming, and they still couldn’t stop it. After 23 seasons filled with a combination of disinterest, failure, hope, perseverance, turmoil and heartbreak – the Jazz had finally broken through to the NBA’s grandest stage. They did so in dramatic fashion with a storybook ending authored by one of the franchise’s two-most beloved players. Until the day comes when the Jazz finally hoist the Larry O’Brien Trophy, this will be as good as it gets. And championship or not – this was still pretty good.